Kumanjayi [deceased] Brown, a Wangkatjunka woman, was born on the Canning Stock Route at a place called Ngapawarlu. She was a prominent artist at Mangkaja Arts. Her process of painting was spontaneous and relied heavily on the gesture and exuberance of colour. 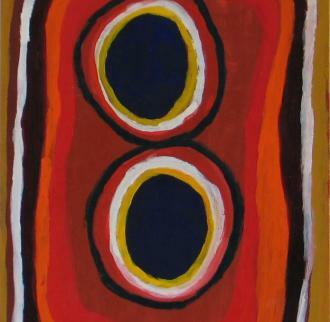 A recurring motif in Kumanjayi Brown’s work is the circle, which indicate places, waterholes and bush foods, to name a few. Kumanjayi Brown was the full brother of Rover Thomas. She lost her mother and father at an early age and was raised by her uncle Jamali Wally Darlington who drove bullocks on the Canning Stock Route. He took her to the Catholic Mission in Balgo where she learnt kartiya [white people] ways before moving to Fitzroy Crossing. She married Pukulu, a leader in the church at the old Fitzroy Mission and together they had three daughters. She worked on the Emmanuel Station around Fitzroy Crossing doing domestic work. My paintings are about my country, my mother’s country and my father’s country. We lived in the desert country (the Great Sandy Desert). I paint the waterholes and bush tucker found at those waterholes. We were living on bush tucker in the desert, on bush tucker only. I paint about the time before we knew kartiya. Kumanjayi Brown married her second husband Hitler Pampa and lived in Mindi Rardi, Fitzroy Crossing for the remainder of her life. She was an important woman in the community for Law and culture. At Nyanpi [corroboree] time she ran the ceremonies for young children. She carried the Women's' Law from Wangkatjunga side right through to the desert side at Balgo.